What Else Can I Expect From an Online Bachelor's in Entrepreneurship Program? Dreaming of starting or growing your new business? The number of new businesses in the United States rose between 2010 and 2015. An online degree in entrepreneurship will set you apart and equip you with the specialized knowledge needed to turn a profit and lead with confidence. You'll learn how to develop a business plan, secure start up investments, and master the tools to grow your business and lead your employees. With an online bachelor's in entrepreneurship program you'll gain the skills to ensure success in your new business venture. 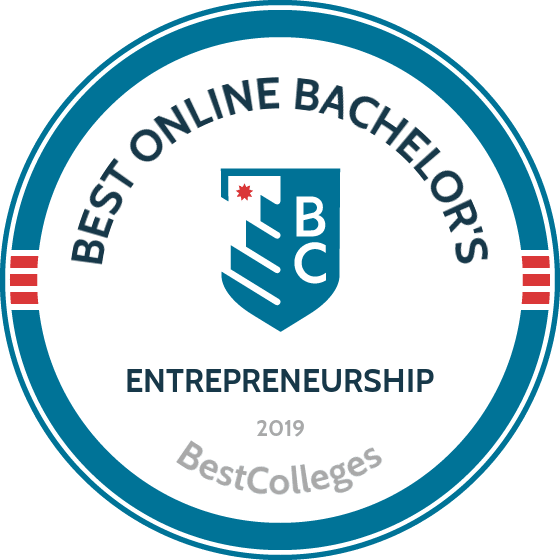 The best online bachelor's in entrepreneurship programs offers coursework tailored for students interested in careers as small business owners, operations managers, or specialists who act as employment or marketing managers. Whether you value growing your own business or playing a pivotal role in supporting an ongoing venture, an entrepreneurial management degree online provides focused training for developing innovative approaches to e-commerce and facing the unique challenges of small business growth. Many online bachelor's in entrepreneurship programs offer the added opportunity to specialize in specific industries, such as sports management, health services, and hospitality. The best online bachelor's entrepreneurship programs equip you with the foundational knowledge to launch and manage a successful business. Many programs offer for-credit internships and creative social opportunities to strengthen your coursework and build your professional network with real-world experience. No matter what you choose, an online degree in entrepreneurship will prepare you with the flexibility to identify opportunities, manage risks, and solve problems. Based in Irvine, California, Brandman University is a nonprofit, private university serving more than 10,000 students online, and across 25 campus locations. Brandman's bachelor of business administration in entrepreneurship is a 120-credit program that equips graduates with skills centered on starting and running a company. Students study core business subjects, along with specialized topics relevant to the entrepreneurship career path. Through coursework and mentorships, students bridge theory and practice to put their newly learned tactical skills to use. The core courses of this online entrepreneurship degree focus on administering a business with courses on accounting, management, marketing, operations, and ethics. In the entrepreneurship concentration, students take seven courses for 21 credits, focusing on topics that underpin small business. Courses cover creating a business plan, competing in the market, securing financing, human resources, and understanding the legal implications of running a business. To enroll in this accredited online entrepreneurship degree at Brandman, applicants must have at least 12 baccalaureate-level credits, and a minimum 2.0 GPA. Brandman only accepts credit earned from another regionally accredited institution. Founded in 1958 to deliver education to the Marine Corps Air Station El Toro in Orange County, Brandman remains a military-friendly institution. The school holds accreditation from the WASC Senior College and University Commission. Founded in 1971, Liberty University is an accredited, evangelical university serving over 100,000 students from around the world. The school offers more than 550 programs of study, including 250 available to online learners. Liberty's 120-credit BS in business administration is available entirely online and offers 19 different specializations. The online entrepreneurship degree provides students with the training to design, launch, and run a new business. In addition to teaching the best practices and principle concepts of small business management, the program covers the risks of starting a business, and how to minimize them. Upon program completion, graduates possess the tools to establish, fund, and manage a new enterprise in a competitive market. Accredited by the Accreditation Council for Business Schools and Programs, this small business and entrepreneurship degree online program accepts up to 90 credits from transfer students, and takes 3.5 years on average to graduate from. The academic year at Liberty offers at eight start dates, and is broken into fall, spring, and summer semesters. All courses in the online BS in business administration with a concentration in entrepreneurship last eight weeks. Liberty provides electronic textbooks for all undergraduate courses at no cost to the student. A military-friendly school, Liberty waives the application fee for qualifying service members, veterans, and military spouses. The school also offers a per-credit discount on tuition for military students. Based in Lynchburg, Virginia, Liberty holds accreditation from the Southern Association of Colleges and Schools Commission on Colleges. Thomas Edison State University in Trenton, New Jersey, is one of the first schools in the U.S. designed specifically for working professionals looking to earn their college degree. Founded in 1972, TESU today offers associate, bachelor's, master's, and doctoral degrees in more than 100 areas of study. The school also offers professional certificates and noncredit courses that prepare students for entry, transition, or advancement in various professions. TESU offers 11 areas of study in the 120-credit BS in business administration (BSBA), including accounting, international business, and entrepreneurship. In the online entrepreneurship degree, students develop skills and perspective needed to identify business opportunities, and launch new ventures. They learn how to secure funding, organize and manage the functional areas of business, and weigh risks and rewards. All students complete a capstone project in strategic management, which integrates all concepts and content areas of the BSBA. For the entrepreneurship concentration, students complete three courses in small business management, finance, and marketing, supplemented by 2-3 electives. Elective courses cover such topics as advertising, consumer behavior, product development, and supply chain. In the professional business portion of the curriculum, learners explore business basics, including the principles of finance, micro and macroeconomics, and computer applications for business. TESU features a generous transfer credit policy that accepts up to 80 credits from courses taken at a regionally accredited community college, and up to 117 credits from an accredited four-year institution. The university also awards credit for exam programs, military training, professional training, licenses and certifications, and portfolio assessment. Touro University Worldwide is a nonprofit, online institution of higher learning based in Los Alamitos, California. Formed in 1970, TUW's mission is to offer online education to working professionals and lifelong learners. Students enrolled in TUW's BS in business administration and management can specialize in entrepreneurship. This online entrepreneurship degree teaches the key components to launching and operating a new business. Learners explore small business management, start-up and e-business formation, and marketing and sales. Graduates leave equipped with the skills and savvy to evaluate and implement business opportunity, apply theoretical training, and weigh the risks and benefits of becoming an entrepreneur. The 120-credit program is split between 45 credits in general education, 39 credits in core requirements, 24 credits in electives, and 12 credits in the entrepreneurship concentration. Students who take a full-time course load of 12 credits per semester can complete the degree in 3.5 years. There are six start dates a year, and each term lasts for eight weeks. TUW does not require college admission exams to apply. As an online university, there are no residency requirements for TUW students. The school holds regional accreditation from the WASC Senior College and University Commission. Founded in 1971, originally as a degree completion school, Metropolitan State University has since grown into an accredited, comprehensive, urban, public university in St. Paul, Minnesota, serving an enrollment of more than 11,000 students. The school offers a student-centered environment, and grants degrees at the bachelor's and master's level. Metropolitan State's bachelor of science in entrepreneurship and innovation is a 120-credit program that teaches students about the functional areas of business and how to manage them effectively. Program graduates obtain the knowledge, skills, and experience to launch their own business, support a family business, invest in a franchise, or become an innovation manager. Courses in this online entrepreneurship degree emphasize communication and problem-solving, as well as ethical reasoning and teamwork. Students learn how to carry out a feasibility study, identify opportunity, and plan a business strategy for a new venture launch. The curriculum in this online bachelor's degree in entrepreneurship splits between six foundational courses, five business core courses, and 10 major courses and electives. Learners take courses in venture creation, organizational behavior, financing, law, product development, and writing. The program culminates with a capstone case study project in strategic management. Students must earn a "C-" or better in all College of Management foundational courses before they can declare for the entrepreneurship and innovation major. Metropolitan State holds regional accreditation from the Higher Learning Commission. Bemidji State University in Bemidji, Minnesota, is a public state university serving students both on campus and online. The student body represents 36 different states and 38 countries. With enrollment approaching 5,500 students, over 94% of BSU's student body pursues one of the school's more than 65 undergraduate degrees. The BS in business administration is available in four concentrations: management, marketing, finance, or entrepreneurship. The online entrepreneurship degree is a flexible, 62-credit, degree completion program that students can complete in two years. Eligible students must transfer at least 24 semester credits to begin major studies toward the degree. The entrepreneurship program focuses on the rewards and challenges of new business ventures and small business ownership. Through advanced courses in case analysis, strategic management, and marketing, students learn to develop a scalable business plan, find and secure capital, and add value to a business over time. The 62-credit program includes 44 credits in business administration core, and 18 in the entrepreneurship concentration. Learners can further tailor their area of focus with technical electives in e-commerce, data modeling and design, and systems analysis. To apply to BSU's accredited online entrepreneurship degree, students should already possess an associate degree or equivalent coursework. The school's extended learning opportunities primarily serve students with jobs and/or family. BSU offers self-scheduled programs and the same tuition to online learners as in-state students. BSU holds regional accreditation from the Higher Learning Commission. Founded in 1956 as Flint Senior College, the University of Michigan Board of Regents officially changed the school's name to the University of Michigan-Flint in 1971. Located in Flint, Michigan, today the UM-Flint welcomes an enrollment of over 7,500 students and boasts a student-to-faculty ratio of 13:1. The bachelor of business administration (BBA) with a specialization in entrepreneurship focuses on topics like product development, conflict resolution, negotiation, team-building, and project management. The degree's scope covers the decisions, activities, and best practices needed to devise and implement an innovative strategy for a new or small business. Many BBA students at UM-Flint transfer in having already completed their associate degree. To apply to the BBA program, students must have a minimum of 25 credits. The business program holds AACSB International accreditation and gives students the option to participate in internships, education abroad, business pitch competitions, and scholarships. Courses in the online BBA are asynchronous, allowing students to balance their professional, personal, and academic life. Admitted BBA students must complete a minimum of 45 credits at UM-Flint, including the last 30 credits. There are eight business majors, with the general business and marketing majors available entirely online. UM-Flint is accredited by the Higher Learning Commission. Founded in 1889, Western Carolina University is the fifth-oldest institution with membership in the University of North Carolina system. Enrollment at WCU exceeds 11,000 students, with learners hailing from across the state, nation, and the globe. The university's online and hybrid offerings are diverse and in-demand, covering the fields of early education, criminal justice, healthcare, nursing, and business. The BS in business administration with a concentration in innovation leadership and entrepreneurship, for example, is among the more popular programs at WCU. Students in WCU's online entrepreneurship degree graduate with the skills to think creatively, launch a new business, or join a startup team. The 120-hour program includes eight courses in the major, and 12 in the business core. Major courses include innovation and creativity, entrepreneurial funding, and new venture creation, execution, and strategy. Learners also take a course in the emerging practice of intrapreneurship, which sees employees applying entrepreneurship capabilities to new products and ventures within an existing firm. Admission to distance learning programs at WCU is a two-step process, first requiring acceptance to the university, then acceptance into the specific program of their choosing, such as the BSBA. As with some other entrepreneurship degree online schools that offer degree completion programs, WCU requires all students enrolled in an online program hold advanced standing (credit for prior learning). WCU holds accreditation from the Southern Association of Colleges and Schools Commission on Colleges. Johnson & Wales University is a private, nonprofit, accredited institution in Providence, Rhode Island, serving an estimated 13,000 students online, and through the school's four campuses. In addition to the school's presence in Providence, JWU also maintains campus locations in North Miami, Florida; Denver, Colorado; and Charlotte, North Carolina. The bachelor of science in business administration at JWU is a 180-credit program that's available in seven majors, including human resource management, international business, and entrepreneurship. The online entrepreneurship degree track concentrate studies on small business management, start-ups, and intrapreneurship. Graduates leave with the skills and knowledge to launch their own business, or provide entrepreneurial thinking and support to small businesses. As with the best online entrepreneurship degree curricula, the program at Johnson & Wales stresses the importance of ethical business practice. Students learn to resolve contemporary business issues, secure capital funding, and develop a viable business plan, all within the framework of ethical decision-making. Courses in the major include marketing for entrepreneurs, change and innovation, managerial technology, and enterprise risk management. Founded in 1914 as a business school, JWU gained university status in 1963. The school first offered online courses in 2008, and its first fully online program launched in 2010. Over 18% of business students at JWU are online learners. JWU holds accreditation from the New England Commission of Higher Education. Peirce College in Philadelphia, Pennsylvania, is a four-year private, nonprofit college regionally accredited by the Middle States Commission on Higher Education. Peirce offers students flexible delivery options that allow faster degree completion, including competency-based programs, and a host of intensive courses per session. Peirce College's BS in business administration with a concentration in entrepreneurship and small business prepares students for the unique challenges new business owners face. In addition to gaining a foundation in business basics, students in this program also explore topics like capitalization, business planning and development, launches, and competitive intelligence. The 121-credit online bachelor's degree in entrepreneurship splits into 43 general education and 78 program requirements. Courses include accounting principles, human resource management, ethical leadership, and policy and strategy formulation. Peirce first offered fully online programs in 2000, and today offers online learners the choice to earn an associate, bachelor's, or master's degree without ever commuting to the Philadelphia campus. Courses are largely asynchronous, with students interacting with peers and instructors through threaded discussions. Students who learn online enjoy the same services as on-campus learners, including access to Peirce's extensive library, advising, tutoring, and academic workshops. Peirce accepts transfer credit from approved accredited institutions, advanced placement examinations, and credit by examination. The school requires students to earn a grade of "C" or higher for applicable undergraduate transfer courses and a "B" or higher for graduate courses. Peirce reserves the right to consider transfer credits from unaccredited institutions as well. Albertus Magnus College is a Catholic college serving an enrollment of 1,125 students on campus in New Haven, Connecticut, and more online. The BS in business management at Albertus Magnus is available in three concentrations: entrepreneurship, human resource management, and marketing management. The program offers flexible course formats that allow students to take online, day, or evening courses. Courses run for eight weeks, with online learners required to attend just two web-based classes a week. Students can complete 30 credits in a year by taking two courses per term. The entrepreneurship concentration requires eight courses for 24 credits. Students study business law, information systems, and issues common to the small or family business. The program provides students with the fundamentals of management and entrepreneurship. Graduates leave prepared to become business leaders capable of making ethical business decisions, and negotiating the risks and benefits of new business ventures. The accredited online entrepreneurship degree at Albertus Magnus College covers the business basics, but also explores contemporary concepts and issues, such as lean launch methodology, social entrepreneurship, and using social impact as a success metric. Gardner-Webb University is a private Baptist university serving approximately 3,600 students hailing from 39 states and 19 countries. Based in Boiling Springs, North Carolina, Gardner-Webb offers dozens of online degrees for undergraduate and graduate students. The BS in entrepreneurship is one of Gardner-Webb's 13 GOAL programs -- degree completion programs that allow students to finish their bachelor's entirely online. Gardner-Webb launched the GOAL program in 1978, offering classes at times and locations that could accommodate students unable to commit to the typical class schedule. The online entrepreneurship degree requires students complete 33 credit hours in the major, 15 of which must be taken at Gardner-Webb. Through the program, students learn how to start a business in today's rapidly changing environment, one that grows more global and tech-focused each day. Topics include new enterprise strategy and management, development challenges of startups, and identifying business opportunities. Further, graduates gain skills in the areas of finance, leadership, marketing, and data. To apply to this small business and entrepreneurship degree online program, applicants must have at least 48 transferable hours from a regionally accredited institution, submit official transcripts, and have a minimum 2.0 GPA. Gardner-Webb does not require applicants to submit test scores from college admission tests like the SAT or ACT. Gardner-Webb holds accreditation from the Southern Association of Colleges and Schools Commission on Colleges. Founded in 1827, Lindenwood University offers programs on two main campuses in St. Charles, Missouri and Belleville, Illinois, and at several learning centers. The school features 115 programs and boasts classes with a 12-to-1 student-to-faculty ratio. Lindenwood also oversees a growing virtual college, which offers fully online degrees to nontraditional learners. The BS in fashion business and entrepreneurship enrolls learners interested in making their mark on the fashion design industry. Students acquire expertise in styles and trends, plus the business acumen necessary to run an enterprise. The business curriculum covers topics such as accounting, finance, marketing, and business law. One course helps learners cultivate their entrepreneurial talents as they learn how to explore business opportunities, develop ideas, conduct market research, and identify financing resources. Faculty devote five courses in the 60-credit curriculum to fashion design, examining the fashion industry, a history of costume design up to and after the 1900s, and today’s fashion business and entrepreneurship. A course on computer-aided design trains learners in the use of various software to construct illustrations and design textiles and visuals. A capstone course engages students in the development of business and marketing plans for their companies. Learners in the online entrepreneurship degree receive hands-on experience while interning at a host organization. They may continue this internship for up to six credits to enhance their learning. Lindenwood does not limit how many credits a student may transfer into the program, and admissions officers evaluate prior transcripts on a case-by-case basis. The University of Minnesota-Crookston makes up part of a five-school system. The school enrolls 1,800 students, equally divided between on-campus and online learners. The institution emphasizes hands-on learning and mentorship; students study in small class sizes with a low student-to-faculty ratios, benefiting from personalized learning. UMC equips all learners with laptops. Students in the 120-credit BS in entrepreneurship learn about the mindset and competencies needed to start and run successful businesses. Faculty teach learners to identify potential ventures, assemble resources, and launch sustainable businesses. All students complete general education requirements, including 40 liberal arts credits. The 59-credit major includes coursework in business law, accounting systems, business planning, and management information systems. Students may customize their degrees with minors in related subjects, such as finance, management, or marketing. One particular course in the accredited online entrepreneurship degree requires students to engage in field study, consulting with local businesses to identify opportunities and/or solve challenges. Faculty give learners access to guest speakers who provide insight on best practices in the business. Students receive hands-on experience when they participate in an internship at local businesses or agencies. UMC's study abroad program provides online learners a global perspective advantage, allowing them to participate in one of 300 options across 67 countries. Students may complete the degree fully online or in a hybrid format, with some courses taken on-campus in Crookston. Admission mandates at least 30 prior credits for transfer students and a minimum 2.0 GPA. Home to 15,000 students, Lamar University is one of the fastest-growing colleges in Texas. Students study on a 292-acre campus in Beaumont, Texas, or online through a distance program. LU emphasizes hands-on learning at all levels, and faculty teach programs in classes with low student-to-faculty ratios. The school's virtual programs draw many nontraditional learners and military personnel. LU provides learners with accelerated online degree options, along with traditionally paced programs. Students may complete the 120-credit bachelor of business administration in entrepreneurship in as little as 48 months. The curriculum's core covers topics such as finance, business technologies, business analysis, and business communications. In one course, learners prepare to work in production management, exploring the analytical tools -- such as critical path scheduling and quality control and forecasting -- that business people use to manage production systems. Six courses focus exclusively on entrepreneurship, as students examine issues such as cost-cutting, the economics of entrepreneurship, financial management, and entrepreneurial market opportunities. In their capstone course, students learn to adapt to globalization, changing markets, new technologies, and governmental policies; faculty use the case study method and/or global simulations to help sharpen learners' decision-making and communication skills during this culminating experience. All online students pay the same tuition rates, regardless of their state of residence. The online entrepreneurship degree requires applicants to submit school transcripts, and transfer applicants to demonstrate a minimum 2.0 GPA. The BBA in entrepreneurship is fully accredited by the Association to Advance Collegiate Schools of Business. Northwood University-Michigan enrolls 3,500 students, most of whom study business administration. For more than 60 years, the college has used a curriculum emphasizing business expertise to cultivate leaders in the field. Unlike at many other institutions, students at Northwood start their business major classes on day one. They also complement theoretic learning with hands-on experience to prepare for the workplace. Online learners can pursue a bachelor of business administration through Northwood, and choose from several areas of emphasis. The 126-credit BBA in entrepreneurship covers subjects such as financial accounting, managerial accounting, entrepreneurship marketing, and entrepreneurial distribution strategies. Students apply their accounting and finance skills in a course focused on new venture finance, in which they learn about cash flows, pro forma development, and how to structure deals for their business ventures. Northwood's BBA features a unique entrepreneurship honors internship, in which faculty pair learners with entrepreneurs or CEOs who mentor them in the junior or senior year. Students also interact with business leaders during roundtables with entrepreneurs-in-residence and other business community mentors. Training programs and workshops hone the skills necessary for free enterprise success. Students develop a business plan for a new venture during the culminating course of the small business and entrepreneurship degree online. Students complete the program entirely online or in hybrid format. All distance learners pay the same tuition rates, regardless of their state of residence. Northwood maintains a generous transfer policy, including an award of up to 30 credits through prior learning credit. The BBA in entrepreneurship is fully accredited by the Accreditation Council for Business Schools and Programs. The Chicago-based National Louis University, one of the most diverse colleges in the Midwest, serves about 8,000 students at locations in Illinois and Florida. NLU offers a comprehensive portfolio of programs, including 17 online degrees. The fully online or hybrid BA in business administration features a concentration in entrepreneurship. Students in this program receive a strong liberal arts education in addition to their business studies. The 180-quarter hour curriculum includes general education in subjects such as English, math, and history. The business core covers an array of business topics, including management and leadership, data analysis for managers, and human resource management. Students use electives to complete the entrepreneurship concentration. Faculty focus on four entrepreneurship areas: small business management; the entrepreneur as manager, leader, and salesperson; entrepreneurship, creativity, and innovation; and an entrepreneurship lab. During the lab, students apply concepts and skills learned in their program to complete a hands-on project. They work in teams to create a prototype product or service, develop a business plan, and present the proposal to a jury. Students may also work to solve an entrepreneurship-related problem within an organization as their lab assignment. Students further augment their business expertise with hands-on internship training. Learners who choose the hybrid format complete some courses on one of NLU's five campuses in Chicago. All applicants, whether freshman or transfer, must hold a minimum 2.0 GPA for admission. The Indiana Institute of Technology enrolls 10,000 students online and in on-campus programs in Indiana and Kentucky. The school specializes in business, computer science, criminal justice, and engineering programs. Students study in classrooms with a 17-to-1 student-to-faculty ratio. Indiana Tech's business programs represent the second-most popular area of study, behind engineering. Business programs include the fully online BS in business administration with a concentration in entrepreneurial studies. This degree blends liberal arts with business education to enable students to create business plans, develop new products, and secure venture funding. All business students complete a 10-course core covering topics such as management principles, personal finance, and organizational behavior. During a course on business policy and strategic planning, students use case studies to examine short- and long-term business planning, plus their implications. The concentration explores entrepreneurship, how to evaluate the potential of start-ups, and entrepreneurial planning and growth. A required entrepreneurship lab serves as the capstone in one of the nation's best online entrepreneurship degrees. Faculty expect students to conduct a feasibility analyses and market research as they develop their business plans. Graduates leave the program with well-honed strategic-thinking and analytical skills. All online students pay the same tuition rates, regardless of their state of residence. The institution maintains articulation agreements with two-year colleges across the state. Indiana Tech also facilitates transfer with merit scholarships, especially for transfer students with an associate degree. Admission requires a minimum 2.5 GPA for transfer students. Lynn University, a small college located in Boca Raton, enrolls 3,000 students in 48 undergraduate degrees and more than 70 graduate and certificate programs. Learners study in classrooms with an 18-to-1 student-to-faculty ratio. Lynn University embraces remote learning opportunities, providing students with educational programs powered exclusively by iPads. The BS in entrepreneurship teaches learners about operational areas such as finance, management, and business strategy, and how to identify and fund business prospects. The 120-credit degree includes a general education core, which covers subjects such as English, computer applications, and ethical decision-making. The major develops learners' proficiencies in areas such as financial management, operations management, and mergers and acquisitions. Faculty help learners develop their creativity and innovation by exposing them to theoretical and applied models that explore the creative process. Learners then engage in exercises that provide insight into their own creative styles, plus strategies to remove blocks to creativity. Faculty encourage students to think about funding for startups with a course that outlines the costs of doing business, when businesses start turning a profit, and where they can get funding for a startup. Students learn from professors with real experience building businesses. They supplement the required business courses in the online bachelor's degree in entrepreneurship with a generous number of free electives. The school issues iPads to all undergraduates. Students fund their education with financial aid, including a limited number of full-ride scholarships from the institution. Lynn University also helps students save money with e-books that cost up to 90% less than traditional textbooks. All students submit school transcripts for admission. Established in 1957, Gulf Coast State College serves three Florida counties. The school manages a catalog of more than 150 accredited programs, and offers a handful of online degrees. Business degrees include the BAS in organizational management, with an option in corporate entrepreneurship. The program comprises 120 credits, including general education credits in math, the humanities, and social sciences. Students complete eight courses in the organizational management core, examining subjects such as financial management, principles of management and leadership, and management risk analysis and decision-making. Faculty use class discussions, case studies, and external speakers to examine the use of Six Sigma methodologies regarding quality control maintenance and keeping organizations competitive. Students complete 18 credits in the corporate entrepreneurship emphasis, exploring issues such as entrepreneurial finance, product development, and entrepreneurial selling. One course of note focuses on the art of selling, in which students learn to build relationships with potential clients and manage sales. Faculty explore sales techniques such as prospecting, lead management, and how to close the sale. For their capstone, students demonstrate mastery of learned concepts as they develop plans to address organizational leadership challenges. GCSC offers some of the lowest tuition rates in Florida, plus a comprehensive suite of financial aid, including institutional and foundation scholarships. Applicants must submit high school or college transcripts for admissions consideration. Founded in 1851, Columbia College enrolls 20,000 students on its main Columbia campus and at 30 satellites in 13 states, and through online learning. The liberal arts college prides itself on small class sizes, with a 9-to-1 student-to-faculty ratio. The school's 29 online degree offerings include a 120-semester-hour BA/BS in entrepreneurship. Faculty give learners a broad business education, while helping them cultivate an entrepreneurial spirit. The degree requires up to 41 semester hours in general education, giving learners a well-rounded liberal arts education. Students must also complete a business core, which covers a comprehensive array of topics such as accounting, economics, strategic management, and business law. Students use 18 credits to complete the entrepreneurship major, examining new venture creation, small business finance, and human resource management. The program also offers business electives, which learners may use to pursue related courses in personal selling and sales management or advertising and sales promotion. CC's Fishman Center for Entrepreneurship supplements business students' classroom education by giving them access to business mentors, business internships, and networking opportunities with potential investors. Furthermore, the school's Student Business Pitch Competition encourages enterprising business students to pitch an innovative business plan before a panel of judges for a $10,000 prize. All online students pay the same tuition rates, regardless of their state of residence. CC, a military-friendly institution, offers significant tuition discounts to military personnel. The school evaluates transcripts to determine how many credits each student may transfer, and awards transfer credit for JST, DSST, CLEP, and the Coast Guard Institute. Applicants must submit school transcripts for consideration. Trinity International University, located in illinois, affiliates with the Evangelical Free Church of America and works to offer an education that equally embraces rigor and faith. Trinity Online features a handful of bachelor's degrees, including a BA in business with a concentration in social entrepreneurship. The 124-credit degree emphasizes a liberal arts education, devoting up to 62 credits to general education subjects like math, English, and social science. In some instances, the school allows learners to apply an associate degree to meet some or all of the general education requirements. The business major comprises 49 credits and equips students with expertise in financial management, marketing, and managerial accounting and analysis. One ethics course examines the application of Christian ethics in business management contexts, and requires that students demonstrate content mastery when applying ethical decision-making skills to address case studies challenges. Learners may allocate 12 credits to a social entrepreneurship emphasis, which mandates a course in how to start up and manage organizations to advance social change. Learners use electives to complete the remaining nine credits, choosing from a comprehensive number of topics such as criminology, ministry programming, marriage and the family, and sport and wellness psychology. Students who come to the small business and entrepreneurship degree online with significant prior credits complete the BA in two to three years. Applicants must demonstrate a minimum cumulative GPA of 2.0 in their prior college or high school courses. Situated in the St. John Valley, the University of Maine at Fort Kent offers comprehensive educational opportunities on its rural campus, located two hours from Quebec City. Despite its setting, school maintains a cosmopolitan atmosphere, enrolling a higher percentage of international students than most other New England colleges. The school offers a suite of online degrees for students who can't attend courses on-campus. The BS in business management offers a concentration in entrepreneurship and marketing. The 63- to 67-credit business major gives learners a sound business foundation in areas such as accounting, marketing, business law, and financial analysis and planning. Students may allocate 30 credits to an online entrepreneurship concentration, which includes courses on small business management, eMarketing, web page design, and human resource management. Learners can strengthen their business credentials with certification in healthcare management, or a minor in coaching or economics. UMFK's strong ties to Maine's business community provides learners with ample internship opportunities. Graduates are equipped with knowledge of the theories and principles necessary for success in today's business environment, plus the quantitative tools and methods for effective business decision-making. Students benefit from services such as tutoring and counseling from the Learning Center. The school champions affordable education, noting that learners graduate with low education debt. UMFK considers applicants' prior work and life experiences for transfer credit. Admission requirements include a minimum 2.0 GPA for transfer students, and a recommended college preparatory track for all others. Franklin University builds degrees specifically for nontraditional learners who must juggle their education with extracurricular obligations. The school's career-focused programs offer hands-on learning, flexible schedules, and full support from start to finish. Franklin also provides learners with fully online programs, requiring no on-campus visits. Learners with entrepreneurial aspirations may enroll in the 124-semester credit BS in entrepreneurship. Whether learners aim to start their own businesses or work as intrapreneurs for large corporations, the degree equips them with best practices for career success. Students must complete 36 general education credits, which many learners transfer in. The business core also mandates courses in financial accounting, business law, marketing, and management principles. The major's five core courses dig into business startups by examining how to generate funding, digital marketing, and the commercialization of entrepreneurial products and services. For their capstone, students develop a business plan using skills acquired in their program. The school awards 24 technical credits for transfer students with relevant licensure, certification, and on-the-job training. More than 90% of students at Franklin University transfer credits earned at other institutions. With the school's transfer credit tool, learners see which of their prior credits apply toward the online entrepreneurship degree. The military-friendly school also allows military personnel to capitalize on their training to finish degrees more quickly. Affordable tuition rates remain a key benefit of studying at Franklin University, which charges all students the same tuition regardless of their state of residence, and offers military personnel steep tuition discounts. Admission requires that submission of transcripts. The University of Maine at Machias, Maine's coastal college, operates as an affordable liberal arts school emphasizing interdisciplinary learning. With only 1,000 students, UMM provides small class sizes and personalized learning opportunities. The school's 11 undergraduate programs include a 120-credit BS in business and entrepreneurial studies. All students begin the program with foundational courses in business finance, business and entrepreneurship, marketing and entrepreneurship, and sociology or psychology. They go on to examine the many facets of business operations, such as accounting, business communications, and human behavior in organizations. A course in managerial decision-making goes beyond what most introductory management courses offer, exposing students to decision-making formulas for developing strategic and tactical problem-solving skills. Another course teaches learners to gain a competitive advantage by using project management strategies to schedule and control projects in their new business ventures. Learners may tailor their accredited online entrepreneurship degrees by choosing a nine-credit emphasis, either in nonprofit organization management or small business and entrepreneurship. Students complete an internship at a for-profit or nonprofit organization to acquire real business experience from mentors; this immersion requires 40 hours of supervised work plus attendance at six seminars and a summative report describing how the learner met all the course objectives. UMM allows learners to transfer in prior credits and develop their own degree completion plans. The university offers affordable tuition rates, and 90% of students receive some form of financial aid. All applicants must demonstrate completion of college preparatory courses. The program admits learners for the fall, spring, and winter terms. Coursework in an online degree in entrepreneurship includes core business management training with an emphasis on the needs of small and new enterprises. Specifics of each program will vary, and depending on your goals, you may want to consider coursework that allows you to focus on a particular industry or facet of business development. Managerial Economics: Students focus on applying economic analysis and models to the problems and decisions of contemporary business situations with this course. Common issues include production strategies, pricing, wages, and investment decisions. Project Management: Beginning with proposal development through planning, execution, and closing, this course assesses essential project management strategies for entrepreneurial contexts. New Business Finance: Learn basic forms of financing your business ventures. Understand the complexities of seed capital, going public, partnerships, and strategic acquisitions. E-commerce For Small Business: Introduces the world of ecommerce and online marketing. Topics include online retail, digital marketing, and website development. Special emphasis is given to the impact of e-commerce on small business practices. Human Resource Management: Managing employee relations and finding expert talent demands specialized knowledge. From benefits and payroll to training and leadership, learn how to handle problems and manage employee relationships. Creativity and Innovation: Examine models of innovation and harness creativity in the workplace with an eye toward design and problem solving. Learn how develop new ideas and maximize growth and profit. HOW LONG DOES IT TAKE TO GET AN ONLINE BACHELOR'S IN ENTREPRENEURSHIP? While a few schools offer accelerated entrepreneurship programs online, full-time students can expect to earn their degree in about four years. Most online bachelor's in entrepreneurship programs require students to earn 120 credits, or 30 credits per academic year. Different programs offer students the option to take courses asynchronously, so work can be completed around your needs. Some programs require students to follow a specific curriculum path and begin their program with a cohort of students. Other programs offer individual pacing, which may allow a student to accelerate their learning or specialize the layout of their course programming. When considering an online bachelor's in entrepreneurship degree, always review the school's accreditation standing. There are six regional accrediting bodies in the United States. Institutions with a regional accreditation are given the highest prestige. Regional accreditation typically ensures the transfer of credits between universities and meets requirements for tuition reimbursement. Regionally accredited programs may be a bit more expensive and require additional coursework in the liberal arts. Schools may also be accredited by a national accreditation agency. Most institutions awarded a national accreditation focus on career advancement and vocational development. Schools accredited nationally may offer more career-oriented programs and provide affordable educational opportunities. Credits from institutions that are nationally accredited might not be accepted for licensure or transfer credit. In some cases nationally accredited programs are excluded from corporate tuition reimbursement programs. Though there are no program-specific accreditations for entrepreneurship, it is recommended that the program you select is endorsed by the Association to Advance Collegiate Schools of Business (AACSB). The AACSB is the most widely accepted nonprofit accreditation institution for business education programs. AACSB accreditation typically means your degree will be accepted if you choose to pursue a masters of business administration or related advanced degree in the future. Students might also look for accreditation from the Accreditation Council for Business Schools and Programs (ACBSP) and the International Accreditation Council for Business Education (IACBE). The AACSB and ACBSP are the most highly regarded business accreditation agencies, though the IACBE does focus on smaller public and private institutions. Overseeing and recognizing approved accreditors is only one function of the United States Department of Education (DOE). The DOA establishes the criteria used by accreditation agencies to evaluate school programs. The Council for Higher Education Accreditation (CHEA) functions as another important player in the accreditation of universities. CHEA is an association of degree-granting colleges and universities that advocate for quality assurance and accreditation to the public and U.S. government. More information about accreditation and a comprehensive list of accredited schools can be found on the DOE and CHEA websites. A recent report, illustrated below, found that among new entrepreneurs, college graduates made up the largest educational category. Entrepreneurs with some or no college education declined between 1996 and 2014, indicating that in today's competitive marketplace, an entrepreneurial management degree online will strengthen your potential for success. Entrepreneurs typically enter the workforce as small business owners. Given the broad applicability of the degree, potential careers for graduates also include positions as general managers, independent business consultants, and product development managers. Salaries for new graduates will be impacted by the industry they enter. Graduates will encounter careers with positive salary growth accompanying time spent in the field. The following table examines how salaries are impacted at different stages of careers. Taking on the most senior, strategic positions in a company, top executives develop operational strategies and procedures to ensure financial goals are met. Contract negotiation, budgetary oversight, performance reporting, and executive staffing are all roles of this position. Depending on the job sector, a top executive may include positions of chief executive officer, general manager, or owner/operator. Specifics of this position depend on the industry and needs of the business. Generally, administrative service managers supervise the facilities and operational needs of a company with attention to record keeping, administrative personnel, general budgets, equipment, supplies, and compliance with security and governmental regulations. Using a variety of collection methods, market research analysts gather data to guide the success of a company's products and services. Forecasting sales trends, advising marketing strategies, and converting complex data for executive decisions are all components to this profession. Melding experience and education, sales managers determine goals, evaluate data, and design training for a business's sales team. Teamwork and a thorough understanding of consumer behavior are essential components of this position. The majority of sales managers have a bachelor's degree and previous sales experience. Research analysts investigate organizations using analytical tools to identify and solve problems while strategizing goals for the future. Advanced technical or quantitative research methods are helpful in this role. Employers typically recruit candidates with master's or Ph.D. degrees, though entry-level positions are available for graduates with a bachelor's degree. Strategic partnerships are essential to your success as an entrepreneur. Professional organizations provide a pathway for students to learn more about the job market and educational needs of their chosen career paths. Below are three organizations to help you connect. These organizations provide online resources, job boards, and even host networking events for prospective students and graduates entering the field. Entrepreneurs' Organization: Considered the cornerstone of organizational support for entrepreneurs, EO has provided new entrepreneurs with mentorship opportunities and continuing education since 1987. Global networking events, online forums, and an online marketplace help business owners to connect and enhance their profits. A sponsored health network provides additional benefits to member businesses. Edward Lowe Foundation: Focused on second-stage companies, the Edward Lowe Foundation specializes in helping businesses move into maturity. Educational opportunities in the form of leadership retreats are coupled with online access to case studies and forums for professional networking. The ELF provides an advanced tool for business to track and compare performance with over 44 million U.S. companies. United States Association Small Business and Entrepreneurship: In 1981, the USASBE grew from the International Council for Small Businesses. The organization is dedicated to education, research, outreach, and policy development for entrepreneurs. Membership includes accesses to networking opportunities, online education, and career services, as well as a subscription to Entrepreneurship Theory and Practice and the Journal of Small Business Management. National Association of Women Business Owners: Founded over 40 years ago, the NAWBO is focused on promoting and supporting the success of women entrepreneurs. Networking and educational events are scheduled year round, and the association emphasizes strategic advocacy goals and engagement with national policy. To learn more about federal funding opportunities, prospective students will need to complete a free application for federal student aid (FAFSA) form. Offered through the U.S. government, the FAFSA provides you with more information on grants, scholarships, loans, and work-study options. Students may also be eligible for private grants and scholarships through nonprofit organizations, companies, employers, and other sources. Approximately two-thirds of college students rely on loans to fund their education, but there are plenty of overlooked financing options you can use to reduce your overall student debt. Online college programs can be a flexible, affordable option for single parents who are interested in earning a degree. We've compiled a list of scholarships, grants, and other financial aid options geared toward single moms and dads.